Undated photo of a terrorist-made rocket loaded with some frightful chemical being fired at some unseen target. The Reconciliation Center managed by the Russians at Humaymeem Airbase in Latakia have announced that the terrorists have now moved their containers of chlorine gas to the forested hills of Hirsh Basanqool. I believe the load is on its way to Jisr Al-Shughoor where my sources tell me the plan is to blow it up as worshipers are leaving the central mosque on a Friday in order to have the most ghastly and provocative scenes possible. I have also been told that because of the amount of coverage of the meeting in Idlib City, to which your editor devoted an entire post, the plan has changed with greater precautions taken regarding security, a demand made by, evidently, one of the British rodents accompanying the crew of mischief-making liars. I also just learned yesterday that the Qataris are paying the salaries of the crew, British, American and Zionist. Some of our readers are puzzled by the lull in aerial bombardment on the part of both Russia and Syria. As I wrote before, there is a dispute concerning how best to expose the false flag operation as a staged event. Hasraayaa: (Yesterday) In Idlib. This is an area controlled by Kataa`ib Al-‘Izza. However, the alliance of Wahhabist terrorist organizations admits of legal trespass by groups such as Nusra and the Turkistaan Party. As those 2 groups were planting booby-traps for the SAA in abandoned homes and utilities, the SAA was monitoring their every move. The operational commander then ordered a precision artillery strike on the offending cockroaches resulting in the deaths of several of them. The sudden escape of the terrorists in their Japanese vans also indicated a large number of wounded. Al-Lataamina Area: (Today) In Northern Hama. SAA was pursuing 2 terrorist groups one of which was a Turkman unit out of Jisr Al-Shughoor heading for the Al-Lataamina area. 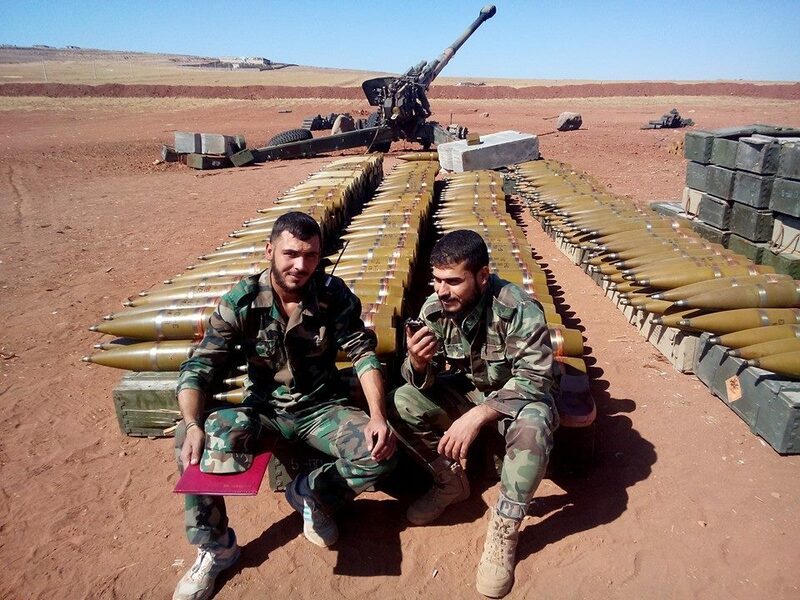 The SAA opened fire with a variety of machine guns and light artillery. No accurate field estimates of rat casualties. Al-Lataamina (Today): SAA artillery based in Zilleen struck at Nusra moving targets. No other details. Igor Bundy reported alot about this incident in our previous post. Well, it was just another dull event in the miserable lives of these mostly Slavic Zionists who just can’t come to grips with the fact that they are not related to any mythical figures in the Old Testament. Most Zionist missiles were intercepted and destroyed before they could reach their targets. Some managed to get through and caused material damage to some crates. However, all in all, their operation failed and numerous trucks carrying the desired payload were seen radiating out to various locations where the weapons will be used to extract the settlers from the land of Palestine once and for all. THE GREAT EXODUS: Uighers, Uzbekis, Chechens, Daghestaanis and a few Albanians are heading north with their families to the Turk border to avoid what they know to be the inevitable push to exterminate them. They are moving their families out of harm’s way. The actual number is not known, but, the Turks are allowing them in as long as they leave the country permanently. Another wave of emigration is also taking place, except, this one is heading south to the areas controlled by the SAA. These are the actual citizens of Idlib who want nothing to do with the terrorists who are planning their own Masada in Idlib. Some are successfully using the Russian humanitarian corridors to escape despite repeated threats of retaliation from the terrorist grubs. It s time for Russia to show a true commando type operation in Idlib, to neutralize the british false flag chemical attack. It could be a perfect moment to show the capabilities of the Spetsnaz forces. That updated photo of “terrorist rocket” is a SAA IRAM short range volcano rocket. Those men are SAA soldiers firing the rocket. Give me a break. Thank you once again for the update Ziad and also for the Moon of Alabama report. Slowly ,things are looking up. Any chance heavy precision strikes could turn the forested hills of Hirsh Basanqool into a fiery hell, killing the assembled terrorrist rats, domestic & foreign and their ZioNato handlers, who are assembling there? 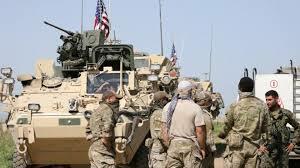 US Marines Conduct Major Drills With Syrian Mercenaries..
Well you zionist rats have been warned, but destroying a host nation is in you blood. Ethno-supremacism is an open door for evil, help slam it shut. These people probably shot those Syrian forces. They all look very anxious about having their picture taken. Track them down! They are dressed as locals. Hindsight being 20/20- It seems very likely that Russia, Syria, Iran and Turkey had a plan for how to manage and resolve the situation in Idlib prior to the movement of the first batch of terrorists into the province. In other words they all co-operatively had a plan. Just to make sure SyrPers are up to speed on the Israhelli attack at Damascus’ airport the other day, that Ziad reports above. Their intention was to hit a cargo that arrived from a plane coming from Iran with Bavar-373 air defense system, the Iranian equivalent to S300. 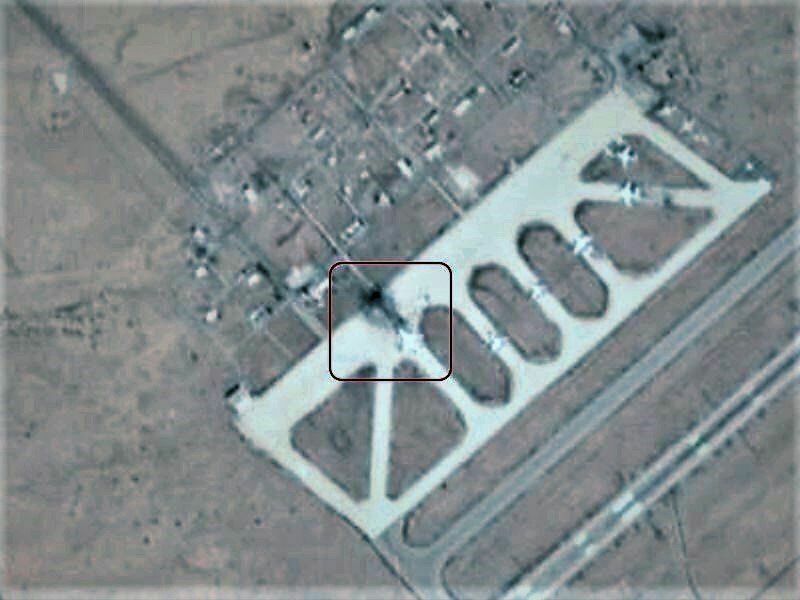 There are no report or news (classified) whether the cargo was hit or not, but the only certainty is that soon we will see Bavar-373 air defense system being tested in Syria on IAF planes. Last year, US backed terrorists struck the international fair with mortars killing six people. It’s clear they want to embarrass Damascus in front of potential reconstruction investors. Izrohelly F-16 ended up in flames over Syrian Golan. A 1000 mile journey begins with the first step. Lets make even bigger, faster planes and kill a lot of Wahabi juices. Power to the ISIS – Al-CIAida exterminators. filthy cockroaches backed by Muricans and Juices. 17-09-61/10 : AL-QARYATAYN MARTYRS BRIGADE TERRORISTs BACKED BY US ACCEPT DAMASCUS OFFER TO DROP WEAPON & MOVE OUT OF AREA! US-backed Militant Group In Al-Tanaf Accepts Evacuation Agreement! These are not the ISIS or Maghawir al-Thurah terrorists. The Russian Ministry of Defence reveals new findings on the investigation into the MH-17 plane crash at a press briefing in Moscow on Monday, September 17. Malaysia Airlines flight MH17 was en route to Kuala Lumpur from Amsterdam when it was downed in the skies over eastern Ukraine on July 17, 2014. All 298 people on board were killed. Missile that hit MH17 traced to Ukraine armory..
Just for our dear Penny……..
Now hopefully you can understand Penny dear why all of the terrorists and erdoggie’s troops will get killed. Due to recent budget cuts, the “Jihadi-Rebels” developed this highly secret weapon that is believed to be “The Game Changer” of Idlib. 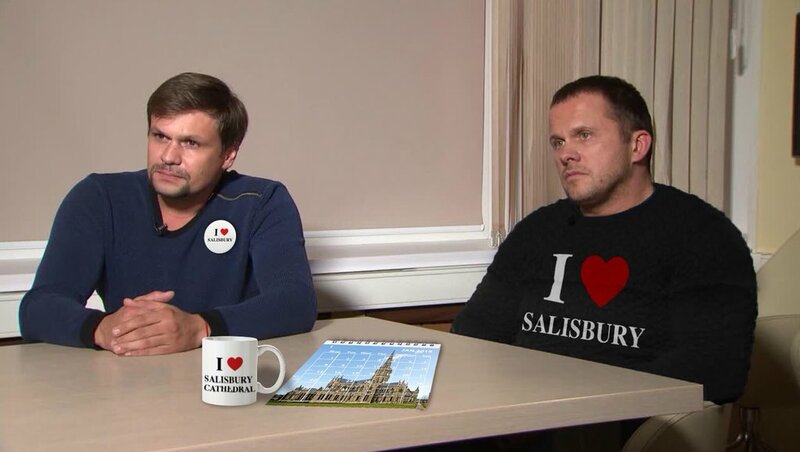 Have a look at Putin………. A well-known activist and former Marine and Iraq war veteran gives a brilliant synopsis of American politics (specifically, Trump and Obama) and the economy today and the way they are impacted and controlled by the international and domestic bankers. This is 20 minutes long and you really should listen to it. This, if true, will make you giddy with tingles running down both of your legs………..
#Syria: satellite imagery shows area bombed 2 days ago by #Israel in #Damascus International Airport, destroying a shipment coming from #Iran. amazing pinpoint accuracy? How come the Russians never give any heads up about what they see in Lebanese skies? #Syria: agreement at Sochi meeting today btwn #Turkey & #Russia to set up a 15-20 km deep demilitarized zone in Greater #Idlib. well , well , well. Looks like Turkey just absorbed Idlib. Nothing personal. Its just business. 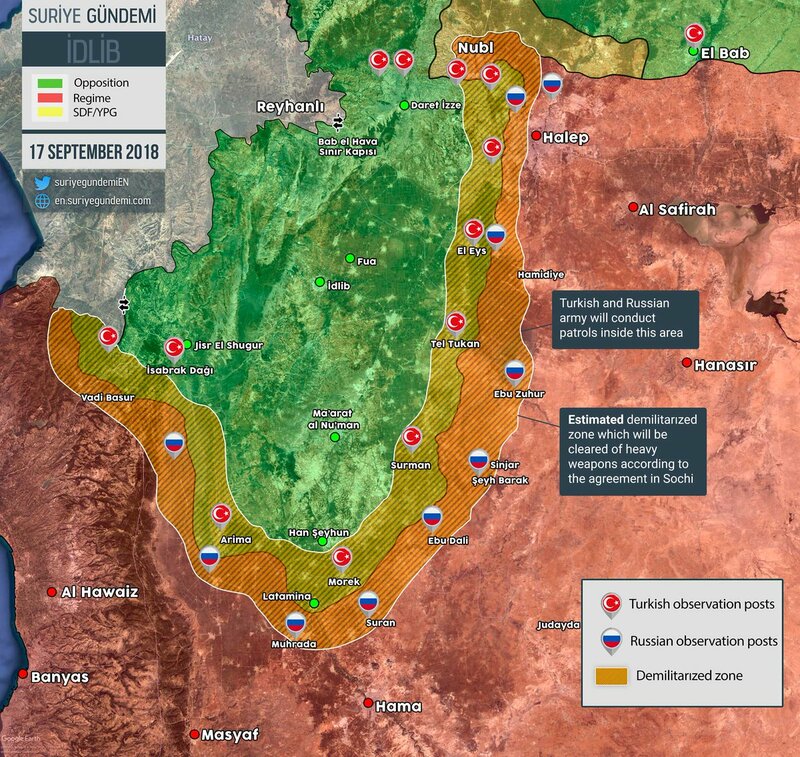 “Syria: Idlib postponed until 15 of Decembre to start with a 15km buffer zone and and engagement of Turkey to disarm Nusra (or merge it) and neutralise all other jihadists”. Is there any question why the new border is within the line between Russian and Turkish outposts? If Idlib is off the menu because of the new DMZ deal Russia agreed to, then what now for the Syrian army ? Do they go after the Us controlled areas ? The Kurd controlled areas ? The remaining Turkish controlled ares , or is it check mate ? Basically, if Russia backed down because of the ZioAmewrican threats on Idlib, then how will they support an attack on these other regions ?